The Athlon 64 X2 is the first native dual-core desktop CPU designed by AMD. It was designed from scratch as native dual-core by using an already multi-CPU enabled Athlon 64, joining it with another functional core on one die, and connecting both via a shared dual-channel memory controller/north bridge and additional control logic. The initial versions are based on the E-stepping model of the Athlon 64 and, depending on the model, have either 512 or 1024 KB of L2 Cache per core. The Athlon 64 X2 is capable of decoding SSE3 instructions (except those few specific to Intel's architecture). In June 2007, AMD released low-voltage variants of their low-end 65 nm Athlon 64 X2, named "Athlon X2". The Athlon X2 processors feature reduced TDP of 45 W. The name was also used for K10 based budget CPUs with two cores deactivated. The primary benefit of dual-core processors (like the Athlon 64 X2) over single-core processors is their ability to process more software threads at the same time. The ability of processors to execute multiple threads simultaneously is called thread-level parallelism (TLP). By placing two cores on the same die, the X2 effectively doubles the TLP over a single-core Athlon 64 of the same speed. The need for TLP processing capability is dependent on the situation to a great degree, and certain situations benefit from it far more than others. Certain programs are currently written for only one thread, and are therefore unable to utilize the processing power of the second core. Programs often written with multiple threads and capable of utilizing dual-cores include many music and video encoding applications, and especially professional rendering programs. High TLP applications currently correspond to server/workstation situations more than the typical desktop. These applications can realize almost twice the performance of a single-core Athlon 64 of the same specifications. Multi-tasking also runs a sizable number of threads; intense multi-tasking scenarios have actually shown improvements of considerably more than two times. This is primarily due to the excessive overhead caused by constantly switching threads, and could potentially be improved by adjustments to operating system scheduling code. Having two cores, the Athlon 64 X2 has an increased number of transistors. The 1 MB L2 cache 90 nm Athlon 64 X2 processor is 219 mm² in size with 243 million transistors  whereas its 1 MB L2 cache 90 nm Athlon 64 counterpart is 103.1 mm² and has 164 million transistors. The 65 nm Athlon 64 X2 with only 512 KB L2 per Core reduced this to 118 mm² with 221 million transistors compared to the 65 nm Athlon 64 with 77.2 mm² and 122 million transistors. As a result, a larger area of silicon must be defect free. These size requirements necessitate a more complex fabrication process, which further adds to the production of fewer functional processors per single silicon wafer. This lower yield makes the X2 more expensive to produce than the single-core processor. In the middle of June 2006 AMD stated that they would no longer make any non-FX Athlon 64 or Athlon 64 X2 models with 1 MB L2 caches. [not in citation given] This led to only a small production number of the Socket-AM2 Athlon 64 X2 with 1 MB L2 cache per core, known as 4000+, 4400+, 4800+, and 5200+. 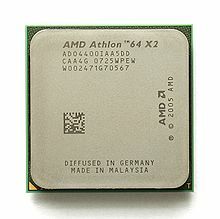 The Athlon 64 X2 with 512 KB per core, known as 3800+, 4200+, 4600+, and 5000+, were produced in far greater numbers. The introduction of the F3 stepping then saw several models with 1 MB L2 cache per core as production refinements resulted in an increased yield. AMD Athlon 64 X2 6000+ (ADA6000IAA6CZ, Windsor), having its heat spreader removed; CPU core is soldered to the heat spreader, causing the CPU to be destroyed during the removal. '64' was omitted from the name of the Brisbane 'BE' series; the 64-bit marketing campaign initiated by AMD became insignificant once essentially all consumer CPUs became 64-bit processors. ^ "Transistors Reference". innoreviews.com. Retrieved 2016-04-29.